Robert Is Here is a fruit and produce stand unlike any you've seen before. 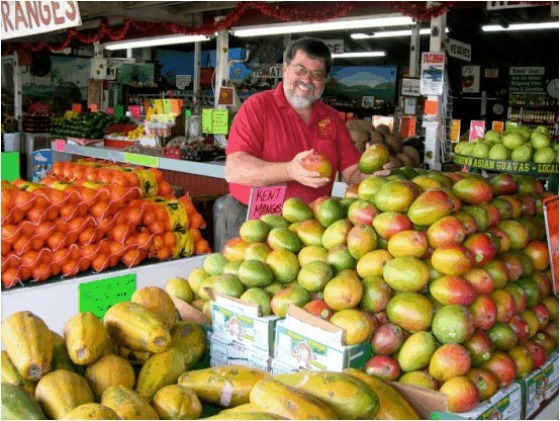 It is a beloved source of fruit and produce for the Florida City and Homestead areas south of Miami, but it is also a tourist attraction that draws people from all over. The fruit stand has been in business since 1959, and as you probably guessed there is an interesting story behind the unusual name. When the owner of the fruit stand, Robert, was 6 years old his dad set him up with a small table on the same corner that houses the modern fruit stand you see today. His dad gave Robert some cucumbers from his farm and told Robert to sell them. That was on a Saturday, and at the end of the day Robert had not sold a single cucumber. 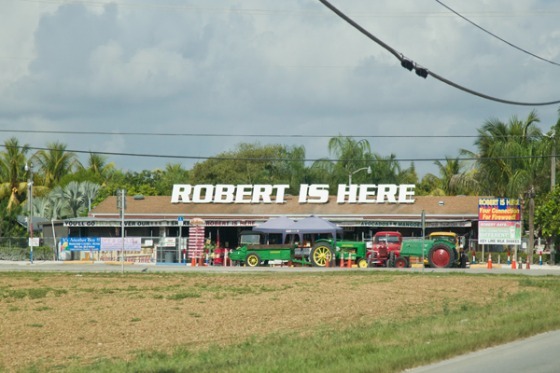 Robert's dad decided that visibility was a problem, so he put up a big sign next to the table announcing that "Robert Is Here". It worked, and before the day was half over Robert had sold all of his cucumbers and went home. Other farmers began adding tomatoes and other produce and fruits and pretty soon Robert had a real business. When he was in school, folks would leave money for the produce in a coffee can. It was one of the earliest honor systems. By the time Robert turned 9 years old he was able to hire a neighborhood woman to run the fruit stand for him while he was in school. He added to his agricultural enterprise by buying 10 acres and planting an avocado grove on it when he was 14 years old. Robert is still around, a gregarious gentleman who really seems to enjoy his work and meeting new people. The store is loaded with fresh fruit and vegetables. You'll find the old favorites like tomatoes, watermelons, papaya, oranges, tangerines, grapefruit and corn, but there are more unusual treats as well. Tropical fruits include carambola, mamey, lychee, atemoya and mangoes. There is a large selection of fresh fruit milkshakes and homemade key lime pies. They even have a key lime milkshake. The stand has a large selection of jelly, jam and preserves. Many of them are created from Robert's mother's original recipes. In the winter months Robert Is Here features live music from a variety of local performers. Check the website of Robert Is Here for more information.